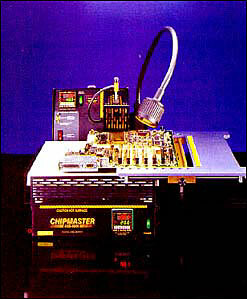 Chipmaster Radiant RAD-6000 | Welcome to A.P.E. The Chipmaster Radiant provides a wide area preheat solution, which gradually and uniformly maintains a temperature sufficient to stabilize the PCB prior to and during the rework operation. 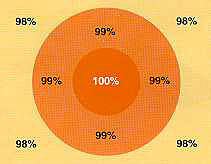 This constant total area heat stabilization is not possible with bottom focal preheat systems. Rework larger PCB’s safelyA common problem in reworking larger circuit boards, typically greater than 16″ x 14″ (406 x 356 mm) is warp during the local heating process. This problem can also be experienced on smaller boards depending upon layer structure and connection distribution. The Chipmaster Radiant solves the warpage problem! The Chipmaster Radiant delivers 144 sq. inches of digitally controlled radiant energy accurate to ±2°F, once calibrated. Its cast aluminum surface may be machined for unique profiling for one or more circuit boards. When equipped with the Low Temperature, High Power technology of the Chipmaster Radiant, youÕll be able to rework soft plastic components at less than 410°F, which would otherwise distort or melt down with conventional systems. The 8100-2424 articulating Board Holder is an important dual-axis mechanism, which positions the PCB over the radiant surface for rework to the circuit board and returns the PCB to its original cool start location for preparation and cleaning. Link to Hot Plate webpage – Click here! Purchase Radiant Package – Click here!